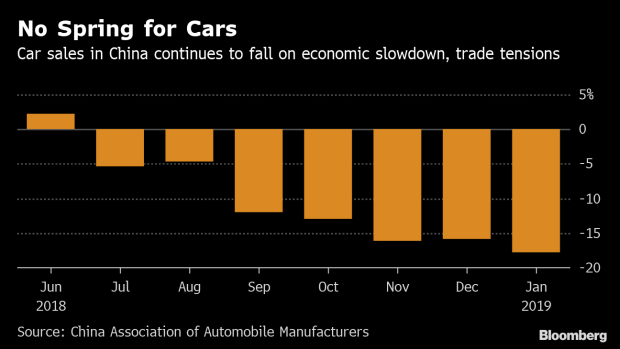 (Bloomberg) -- Car sales in China continued to decline in January after their first full-year slump in more than two decades, adding to pressure on automakers who bet heavily on the market amid waning demand for cars from the U.S. to Europe. Wholesale passenger vehicle sales fell 17.7 percent year-on-year, the biggest drop since the market began to contract in the middle of last year, the China Association of Automobile Manufactures said on Monday. The persisting slump leaves carmakers with few places to go for sales growth. The markets in Europe and North America are shrinking as the increasing availability of ride-hailing and car-sharing services makes it less necessary to own a car. Japan is sputtering too, while volumes in other smaller markets aren’t enough to offset the declines in the biggest sales regions. Sales in China continue to be suppressed as the world’s second-largest economy slows and negotiations with the U.S. for a trade-war truce drag on. Consumers stayed away from showrooms even with discounting by dealerships ahead of the Chinese New Year Holiday. The wholesale decline in January, to 2.02 million units, accelerated from a 15.8 percent slump in December. For last year as a whole, the drop was 4.1 percent, the first decrease since the early 1990s. The first half of 2019 will continue to see downward pressure, as a purchase-tax cut in effect in 2016 and 2017 prompted many consumers to purchase vehicles earlier than planned, and now have no need to buy, said John Zeng, managing director of LMC Automotive Shanghai. Car manufacturers that spent billions of dollars adding plants and production lines in China in the past decades are now uncertain if and when growth will return. The economic and geopolitical hurdles are prompting the companies be more cautious with their annual sales targets. Geely Automobile Holdings Ltd. targets sales of 1.51 million cars this year, an increase of just 0.7 percent from 2018. Volkswagen AG, the No. 1 foreign manufacturer on the mainland, is expecting further growth for the company this year, but has predicted the overall Chinese market to shrink in the first half. Jaguar Land Rover Automotive Plc’s problems in China forced its parent to take a $3.9 billion writedown this month. Daimler AG and BMW AG reduced profit forecasts last year amid pressures from the U.S.-China trade war that’s hit auto demand, while Hyundai Motor Co. said last month it’s letting workers go as it reviews production plans in the country. What’s happening in China is a reflection of the situation worldwide, with rising prices, political upheaval, dislike for diesel and new services such as Uber and Lyft eating into auto demand in markets such as the U.K. and the U.S. In Europe, car sales declined for a fifth straight month in January, while in the U.S. the top four premium car brands all posted sales declines last month to deepen a slump that began taking hold near the end of 2018. President Donald Trump has threatened a tariff of as much as 25 percent on imported autos, risking a further hit for vehicle demand. The association expects the market to be little changed in 2019. Last month, the government announced measures to spur car demand but the move fell short of expectations and lacked details. The stimulus actions include letting local governments provide subsidies to rural residents for purchase of some types of trucks and cars. Carmakers are now increasingly placing their bets on electric vehicles, which are gaining popularity amid China’s environmental policies. The state introduced stringent rules to promote the sale and production of greener cars, with major manufacturers facing penalties unless they meet quotas for zero- and low-emission cars or buy credits from other companies that exceed the quotas. The China Passenger Car Association, another industry group, is scheduled to release the retail sales figures for passenger vehicles in January later Monday.